You can now register your own card for Fraud Alerts through Online Banking. Click the Link below for a Step-by-Step guide on Enrollment. Due to the current security situation in Haiti and the political landscape in Venezuela, in an effort to keep your members safe, PSCU has removed the options to book travel to and within those destinations, i.e. air, hotel etc. Our Travel vendor, Montrose Travel, is always looking at global events that might impact the safety and wellbeing of travelers. They rely on information from suppliers and governments which provide travel advice for locations around the globe. This will remain in effect until the situation improves and travel advice changes. People across the US are getting phone calls or emails from scam artists who pretend to be from the IRS or Department of the Treasury. They demand immediate payment of overdue taxes and threaten lawsuits or jail. They look and sound convincing, but they are trying to steal your money and your identity. Members and non-members who have mobile numbers with a 608 area code are receiving scam text messages saying their Debit card is blocked. 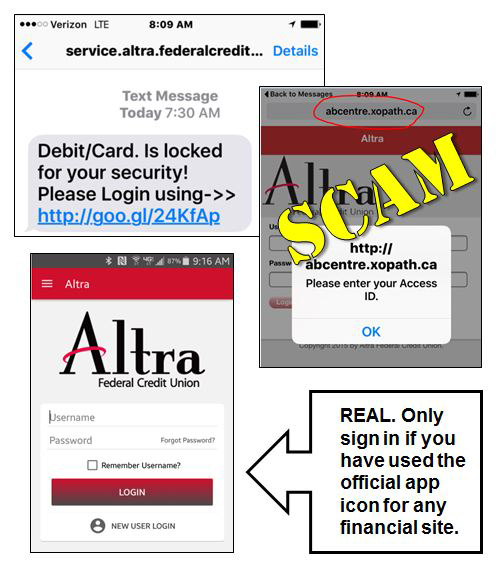 There is a link in the text to sign in to unlock, which takes them to a fake Altra mobile banking site. If you receive one of these texts, DO NOT CLICK the link or enter any personal information. Never access any mobile financial site unless you are using the official app icon from the app you downloaded from iTunes or the Google Play Store. Altra will never contact you directly to verify any account information over the phone or through email. If you have any questions or concerns, please call us at 800-755-0055. If you receive an email purportedly from Altra that you feel is suspicious, please FORWARD that email to [email protected] to verify its authenticity.